Bushido Tactical is operated and instructed by Wade Rorich who has former South African Police Service and South African Defense Force experience. He has taught military, law enforcement and security personnel and responsible citizens from all over the world for the past 23 years. 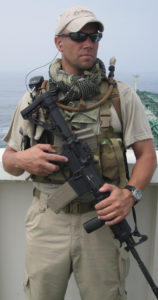 He is a former staff instructor (Train the trainer) for Surefire Institute LLC and Strategos International LLC where he was involved in teaching military and law enforcement in small arms tactics, prevailing in low light conditions (5 day tactics school), response to an active shooter, team tactics, close quarter battle and defensive tactics. He has also had the privilege to instruct at such facilities as Gunsite and the Sig Arms Academy while working for his past employers. Wade was previously contracted to provide private maritime security aboard vessels in the Middle East aiding in Anti Piracy attacks. Wade currently travels abroad to work with Counter Terrorism Units and Specialist Firearm Officers. Wade is a Master level competitive shooter in multiple IDPA and GSSF disciplines and also competes in USPSA and 3 Gun competitions. He is the lead designer of BT’s tactical nylon product line utilizing his past real world experiences to manufacture, practical and well thought out gear. Starting in 2011, Jenifer has been responsible for the management and facilitation of our business financing, FFL management, and tactical training course administration. As the first female member of the Bushido Tactical Competitive Shooting team, we are honored to have her in our midst. Bushido Tactical contracts select personnel / instructors to help teach or assist with various specialized courses. All staff are throughly vetted before being contracted. They are either experts in their field or have prior military, (including former Special Operations), law enforcement or private security contractor experience. Personal Instructor BIO’s will be discussed in detail at the relevant courses. The Team consists of 4 sponsored shooters who compete in USPSA, IPSC, IDPA and 3 Gun Championships on a regular basis. They comprise of Master shooter rankings and constantly place in the top 5 in their divisions in major matches on multiple occasions.